An estimated 30,000 Munster supporters turned out in Limerick this evening to welcome home the Heineken Cup rugby champions. 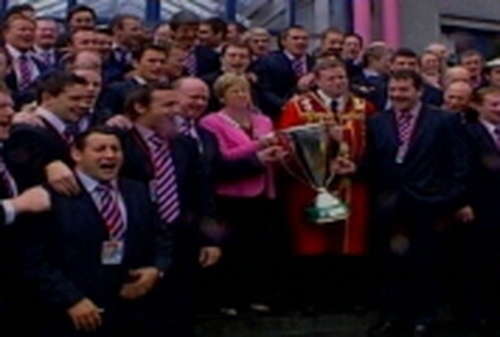 The team - which beat Biarritz in Cardiff yesterday - travelled through the city in an open top bus before been greeted by the Mayor of Limerick, Councillor Diarmuid Scully, at a civic reception. Meanwhile, hundreds of fans trying to return home from Cardiff are stranded in Holyhead, following the cancellation of Stena Line's HSS Ferry to Dun Laoghaire due to technical problems. Arrangements are expected to be made to carry them on an Irish Ferries sailing at 3am.